Welcome to the wonderful world of the Amico Vertical Bbq! With the combination of ease of use, versatility and a method of grilling which is tastier, healthier and reduces the amount of smoke, the Amico collection of barbecues will be sure to impress both your family and friends. It will be sure to serve all your cooking needs, and compliment your lifestyle. We start with the Pick-nic. This is an amazing light-weight portable design that allows you to take it with you in your vehicle, camper, rv, boat or carry it anywhere on your property. With this barbecue you can eliminate the hassle of gas tanks, connections and costly accessories. This is the perfect bbq that will go anywhere that you want to go. Next is the Family. 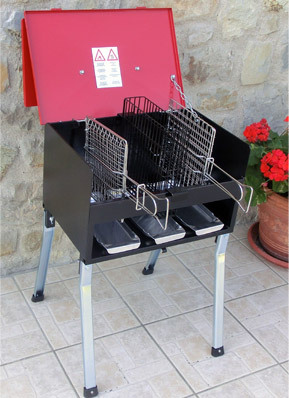 This bbq is ideal for the family and is designed for everyday use. As with all Amico bbqs, the reduced cooking time along with the variety of foods that can be cooked is perfect for everyone’s tastes and for todays busy lifestyle. Finally, the Festa bbq. This bbq is meant for people who love to entertain family and friends. A larger cooking surface and multiple grills allows for many types of food to be cooked simultaneously in larger quantities and in a short period of time. So, not only does the Amico family of barbecues produce great tasting food in a healthier and quicker way, but it is built with superior materials and workmanship which are guaranteed to last. The initial barbecues which were produced over 20 years ago are still in use today! From the time you receive your new bbq to the time of grilling is only minutes away. Amico certainly eliminates the frustration, difficulty and time of assembly that comes with traditional barbecues. Foods that were traditionally difficult to grill such as chicken wings, shrimps, vegetable and scallops are barbecued quickly and easily with this cooking method. You are only limited by your imagination and creativity! We are sure that once you have purchased the Amico Vertical Bbq you will wonder how you got along without one.